This carefully composed letter centers on the theme of Christ's sovereignty over all rulers and powers in the universe. The letter is structured in a way that draws its hearers or readers into its center point through a literary pattern resembling a set of concentric circles. It begins and ends with opening and closing greetings. Prayers of thanksgiving and intercession come after the opening greetings and again before the closing greetings. At the structural and thematic center, the letter proclaims Christ's sovereignty over rulers and powers and promises its audience that God "made you alive together with him," that is, with Christ himself. The Christ hymn or confession in Colossians 1:15-20 announces the twin themes of the letter, proclaiming Christ's lordship over all the powers of the universe and Christ's lordship of our lives. Christ is the firstborn of all creation and the firstborn from the dead. Paul's Letter to the Colossians is the twelfth book in the New Testament. It is situated in the midst of the "Pauline corpus," the collection of letters attributed to the Apostle Paul (the books of Romans through Philemon). The letter includes a concluding signature (4:18) from the Apostle Paul, yet literary and theological characteristics of Colossians suggest to some that it could have been written by another person who wrote in Paul's name and authority. 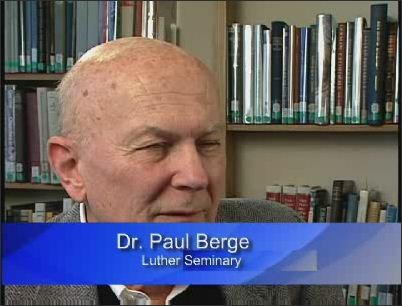 The letter's sentence structure, vocabulary, and theology could indicate a later author or Paul himself using a uniquely rich vocabulary to address new areas of concern. Colossians claims to come from a time of the Apostle Paul's imprisonment. If Colossians was written during the period of his Roman imprisonment, the letter would fall into the later years of his life, around 61-63 C.E. Christ Jesus, the firstborn of all creation and firstborn from the dead, is the one who has conquered all powers and the one to whom all the powers of the universe are subject. Colossians is very carefully composed so that its message would be easily recalled after it was read aloud in the Christian community. Through a series of sections arranged like concentric circles, the first half of the letter draws readers into the center, and the second half draws them from the center through the complementary sections to the conclusion of the letter. The entire composition of the letter is brought to a focus in the central proclamation of the sovereignty of Jesus Christ over all the powers of the universe. Centered in Christ's death and resurrection, the letter proclaims the message that believers have been made alive together with Christ. This section and the closing verses (4:7-18) form a ring around the letter. Here, Paul and Timothy greet those "in Christ" in the city of Colossae. The authors offer petitions that resemble the prayers that appear at the letter's end. These opening prayers express thanksgiving to God (1:3-8) and intercede on behalf of the Colossians (1:9-12). Drawing upon an ancient hymn or confession about Christ, the letter describes Jesus as the one through whom God delivers, as God's firstborn before creation and as God's firstborn from the dead. Jesus Christ proclaims the mystery of God, a mystery that has been hidden for ages and generations, a mystery that God has chosen to make known among the nations. Christ himself is the knowledge of God's mystery. In its thematic and structural center (2:10b-15), the letter declares, "God made you alive together with him [Christ]." Just before this declaration is an exhortation to walk in Christ; an exhortation to grow in Christ follows the declaration. Believers have died with Christ and been raised with him. Readers are instructed therefore to put to death their earthly members, having themselves been clothed as the elect of God. Instructions for community life are addressed to wives and husbands, then to children and parents, and finally to slaves and masters. The Colossians are told to persevere in thanksgiving and intercession, to walk in wisdom, and to speak graciously. The letter concludes with personal greetings followed by a final word claiming to be written in Paul's own hand. The city of Colossae was located in the Lycus River Valley and was a neighboring city to Laodicea (Colossians 2:1-5; 4:15-16). Religious and philosophical currents of the first century, some of which found a home in Colossae while others moved through the city, reflect diverse religious practices, dualistic thought patterns, pagan mystery cults, worship of physical elements and powers of the universe, abstinence, asceticism, observances of festivals, and syncretistic blending of all the above. Into this mix of religious thought and practice, the Colossian letter enters around 61-63 C.E. Attempts to define an exact background against which to interpret the letter are legion and provide endless speculation. Questions surrounding the composition of the letter itself connect to a host of issues. They reflect major interpretive concerns, revolving around authorship, use of language, theological thought, and grammatical style. These interpretive areas have been drawn upon to question whether the letter came authentically from the hand of Paul, suggesting that the letter represents thought from a later time and thus is a pseudonymous work from the hand of someone who wrote in the authority of Paul. The Colossian letter is a literary masterpiece, no matter who finally gave it its present form. The concentric-circle literary pattern suggests that the letter was artfully composed to be remembered from an oral reading, drawing the reader into the complementary sections that lead to and follow from its center point. The letter proclaims the sovereignty of Christ over all the powers of the universe. Despite the major interpretive questions, the contemporary reader is drawn into a proclamation and teaching of the gospel that discerns and engages the context and thought of its day and becomes a paradigm for proclamation and teaching today. • Authorship. At its beginning and conclusion, Colossians identifies Paul as its author (1:1; 4:18). The extensive listing of personal names indicates that the author knew several members of the Christian community in Colossae (4:7-17). Many of these names are also represented in the letter to Philemon, linking the two letters together (see Philemon 1-2, 23-24). The internal relationship of the two letters suggests to many that both have come from the hand of Paul. However, the Colossian letter is often interpreted as reflecting a later time in the church, representing a theology that is different from the seven undisputed letters of Paul (Romans, 1 and 2 Corinthians, Galatians, Philippians, 1 Thessalonians, and Philemon). The decision on the question of the authorship of Colossians rests with each interpreter, and a definitive answer cannot be given. This does not, however, detract from the authority of the letter. The letter is written with complete integrity, addressing critical issues for the Christian community in Colossae for its time. The legacy of Colossians lives on, addressing critical issues for the church through the centuries and proclaiming the sovereignty of Jesus Christ's lordship over all powers present in the world. • Christ over the rulers and powers. The terms rulers and powers (the latter can also be rendered as authorities) occurs three times in Colossians (1:16; 2:10, 15). The first occurrence is introduced in the Christ hymn or confession of 1:15-20. These verses proclaim that everything in the entire universe is under the lordship of Christ, "for in him all things in heaven and on earth were created, things visible and invisible, whether thrones or dominions or rulers or powers--all things have been created through him and for him" (1:16). From the Christ hymn or confession to the center of the letter we are drawn into the proclamation of Christ's sovereignty and the relationship of Christ's lordship to the life of faith: "For in him the whole fullness of deity dwells bodily, and you have come to fullness in him, who is the head of every ruler and authority" (2:9-10). The fullness of Christ's deity and lordship over all is brought to completion through the fullness of life in him. This fullness of life is manifested in our identity in Christ's death and resurrection (2:12-13), giving us the assurance of Christ's victory: "He disarmed the rulers and authorities and made a public example of them, triumphing over them in it [Christ's death and resurrection]" (2:15). The triumphal arch through which vanquished armies were paraded by the victors is the image behind these words, an image well known in the Roman world. • The family of faith under Christ's lordship. The relationships of wives and husbands (3:18-19), children and parents (3:20-21), slaves (or servants) and masters (3:22-4:1) have been transformed in light of the sovereignty of Christ's lordship in the universe (1:13-20). These two sections (1:13-20 and 3:18-4:1) stand in a complementary literary relationship within the concentric-circle structure of the letter. The two sections are linked together insofar as both reflect oral and literary expressions that were previously known in the community. The first section proclaims God's deliverance from the powers of darkness in his beloved Son (1:13-14) and incorporates a hymn or confession of Christ (1:15-20). The complementary section consists of common household rules for living in community (3:18-4:1). What is unique to the Colossian letter is how these two sections interpret one another theologically. Because of Christ's sovereignty throughout the universe, as proclaimed in the introduction to the Christ hymn and confession (1:13-14) and in the hymn and confession itself (1:15-20), all human relationships--wives and husbands, children and parents, slaves and masters--have been transformed under Christ's lordship. Believers are free now to live as loving servants or slaves of one another, as Christ is servant or slave of all and Lord of all. • Mystery religions and the mystery of Christ. The word mystery occurs four times in Colossians (1:26, 27; 2:2; 4:3). Various mystery cults found their home and practice in cities of the Mediterranean world; this was certainly true in the Lycus River Valley where Colossae was located. Various rituals and forms of secret knowledge were introduced and imparted to the initiates to link them with gods and goddesses that would assure their souls of salvation from this world of darkness upon the death of their bodies. Colossians offers a direct response to such thought and practice, proclaiming the mystery of Christ's lordship over all the powers and deities in the universe, and expressing a word of hope for all people enslaved to the mysteries of the time. According to God's commission, Paul was called "to make the word of God fully known, the mystery that has been hidden throughout the ages and generations but has now been revealed to his saints" (1:25-26). This revelation of God has made known to all people "the riches of the glory of this mystery, which is Christ in you, the hope of glory" (1:27). The knowledge of God's mystery is not an elitist system of special knowledge, but God's revelatory word made known for all in "Christ himself, in whom are hidden all the treasures of wisdom and knowledge" (2:2-3). As Paul writes this letter from prison, his proclamation of the gospel has not been hindered, and he writes with the hope "that God will open to us a door for the word, that we may declare the mystery of Christ, for which I am in prison, so that I may reveal it clearly, as I should" (4:3-4). • Intercession. The prayer of intercession in Colossians 1:9-12 calls forth words significant to various cults and religious practices of the time and within the context of life in Colossae. Paul takes this language and uses these words to proclaim the lordship of Christ, who alone is the source of "the knowledge of God," the true source of "spiritual wisdom and understanding," the one in whom is "the strength that comes from his [God's] glorious power," (1:9-11), and the one in whom the Colossians "share in the inheritance of the saints in light" (1:12). • Knowledge. The letter contains language that reflects philosophical and religious thought of its day, especially ideas about acquiring special knowledge that can serve for salvation. Paul takes the language of the time and transforms its understanding so that it serves the proclamation that Christ is the source of all knowledge, spiritual wisdom, and understanding (1:9-10). Christ is the one in whom God's mystery has been revealed (1:26, 27; 2:2; 4:3) and the one in whom "the whole fullness of deity dwells bodily" (2:9). • Thanksgiving. Typical of Paul's letters, Colossians expresses thanksgiving for the relationship in Christ that Paul and Timothy share with the readers (1:3-8). The relationship for which Paul gives thanks is based in the familiar triad of faith, love, and hope: "for we have heard of your faith in Christ Jesus and of the love that you have for all the saints, because of the hope laid up for you in heaven" (1:4-5). This is the gospel that is "bearing fruit and growing in the whole world, so it has been bearing fruit among yourselves from the day you heard it and truly comprehended the grace of God" (1:6). • Universal powers. A group of words that center around references to "rulers" and "powers" (or "authorities") and "elemental spirits [or elements] of the universe" (1:16; 2:8, 10, 15, 20) is important in the letter. Paul adopts language of universal powers and spirits, transforming prior references and understandings by now using them to proclaim that Christ is Lord of all rulers, powers, authorities, and elemental spirits of the universe. There is nothing outside of Christ's sovereignty and lordship in the universe.